Kohanaiki Golf & Country Club is a brand new resort community on the just 6 minutes south from the Kona International Airport (KOA), while this private resort neighborhood is unique in that it is one of the only sustainable resort communities on the Big Island and we are a big supporter along with in Energy Independent Living. It also is one of the last opportunities to buy new waterfront real estate on the Big Island. It’s no wonder why there’s so much buzz surrounding this highly anticipated release. Residents at Kohanaiki Resort enjoy all the comforts you come to expect from a world-class resort along with some innovative additions like its Audubon certified Silver Signature golf course, renewable energy sources and an on-site biodynamic organic community farm. Homebuyers have plenty of options to choose from at Kohanaiki Golf & Ocean Club. Finished 2-3 bedroom Townhouses are ideal for those part-time residents and retirees searching for a low-maintenance option. The Townhouses also feature a private swimming pool as well as a spa for hours of relaxation. The developer also offers a limited selection of single-family homes at Kohanaiki Resort. These Shay Zak designed homes are modern interpretations of a traditional hale, a basic hut that has been used by Hawaii’s ancestors for generations. Nothing about these luxurious residences is simple however. The 3-4 bedroom homes come with fenced yards for privacy, tropical landscaping and swimming pools. Prefer to start from scratch? Kohanaiki Golf and Ocean Club also offers homebuyers a chance to build their dream home on a number of custom homesites which range in size from 0.5 acres to an acre. 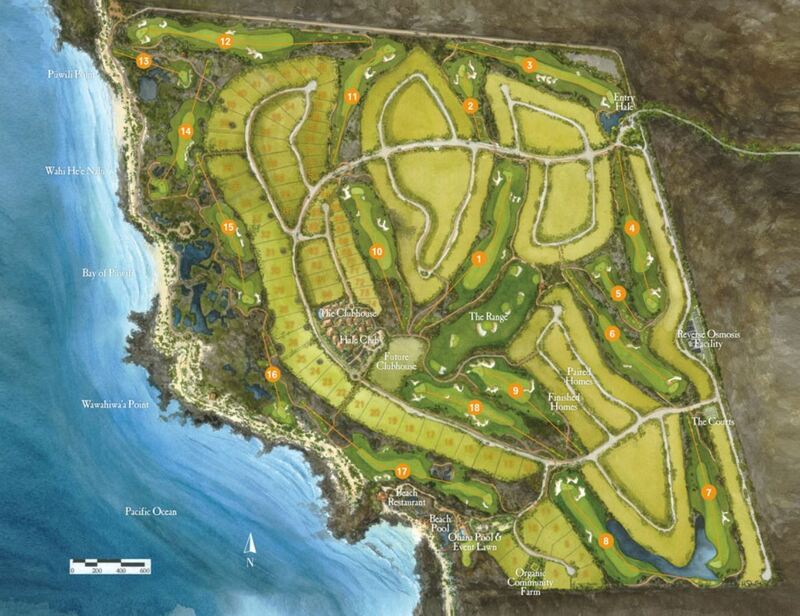 All of these sites will feature panoramic ocean and golf course views in addition to outstanding views of the Kohala Mountains, Mount Hualalai and Mauna Loa. Sustainable doesn’t mean that there is ever a shortage of things to do at Kohanaiki Resort. Residents can take advantage of the Kohanaiki Club, and gain access to all the resort’s amenities including its exclusive beach club, pools, a Rees Jones designed golf course, a tennis center with clubhouse, as well as fitness and spa facilities. You can also find quality dining options at the Club House. Kohanaiki Golf and Ocean Club even has its very own dedicated Adventure Team who can arrange everything from canoe and stand up paddle board to private sports fishing excursions and scuba diving sessions. The property also features some great coastal beach trails, an organic community farm for resident use, and a family-friendly Ohana pool and lounge area completed with water slides and a grilling area for entertaining. A quick drive to Kailua-Kona provides lots of stunning beaches as well as cultural gems like Ahuena Heiau, Mokuaikaua Church, and Hulihee Palace. Kona is also where you will find the world-famous Kailua-Kona coffee. Average Listing price $0M Based on 0 listings. Priced from $0 to $0.